Simon Schama explores the depiction of nature. Simon discovers that landscape painting is seldom a straightforward description of observed nature. Browse content similar to Picturing Paradise. Check below for episodes and series from the same categories and more! ..what you want is to be somewhere else. Somewhere you can breathe in peace. A scrap of beauty, far from the noise and ugliness. ..and you paint that landscape into existence. This is what happened in China in the 1970s to the artist Mu Xin. he was an obvious target. Middle-class, intellectual, a lover of decadent, Western art. forced labour and then house arrest. became the material of his liberation. the landscapes which unfolded in his mind. The art memory of China, its peaks and its valleys. 1,000 years before, true landscape art. that art - now judged a reactionary crime - would survive. to the anarchy wrought by the hand of man. but a vision of the way we would like it to be. Sometimes, it's a picture of a nation's home. Sometimes, it's a dream of heaven writ in fabric. Or glimpsed through a lens. our place in the cosmos. "The nation is broken, but mountains and rivers remain." but, actually, they were written 1,000 years earlier. In the early 10th century, China was torn apart by endless civil war. they burned cities and towns, and slaughtered their people. as the great subject of art. and a means to unite this shattered country. This painting is more than 1,000 years old. symbols of the Song dynasty. the lesser peaks are his ministers. to perhaps dumplings being cooked in the back kitchen there. not just with people, there's all sorts of things going on. This is our world, this is the place we inhabit. This is more than mere propaganda. also ascends to a higher order of question. It is the place of equipoise, the place of peace. and Li Cheng has changed the wash of the ink. It's lighter, finer, more ethereal. and gradually we move up and face the greatest questions of all. What lies beyond surface appearance? What truly moves the universe? to the majesty of the cosmos. fills the mind with the ancient Confucian sense of rightness. Everything in its ordained place. 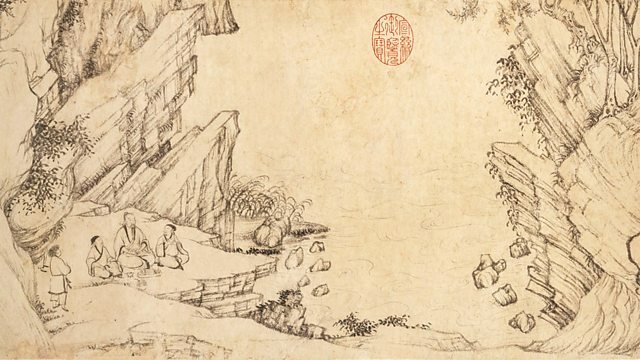 landscape art had sunk deep roots into the culture of Song China. New painting academies flourished where it was practised. Weighty tomes were written about its philosophy and technique. the painted landscape evolved into something new. and travelled almost cinematically through space and time. This hand scroll was painted by the artist Qiao Zhongchang. a man of culture and refinement, called Su Shi. as his wife sees him off on the journey. We turned the boat loose to drift with the current. All around was deserted and still. A lone crane flew overhead. and the melancholy of the exile. A dream, but one with a bittersweet taste. But landscape painting wasn't always about escape. Sometimes, artists captured the violence of history. China's Song dynasty had fallen to Mongol invaders. his family's estate in the Qingbian mountains. Those mountains became the subject of his greatest painting. which this is, words somehow struggle to be formed. But I'm going to do my best. we have about Chinese landscapes. and it is all about feeling protected by the Imperial mountain. None of this is happening with Wang Meng. This is, above all, a painting about turbulence. It's full of a kind of restless, writhing, sensuous, intense energy. There's a reason for this turbulence. of a battlefield fought over by armies 200,000 strong. The reality was marauding and massacre. These are not mountains which protect us. Instead, they trap and threaten us. and is echoed by the shape of the peak. but the man has nowhere to go. There are paths which make no sense at all. He moves his way through scrubby pines. to make it more exciting, to make it more perilous and energised. Eventually, we see one isolated, tiny figure, alone. look as though they're about to topple down on him. and his own feeling of insecurity. in these sudden, jabbing, repeated strokes. This, then, is a state of mind rather than a state of mountain. then his sense of foreboding was well founded. he fell victim to his political enemies and died in prison. Sometimes, the vision of boundless space will set you free. But, sometimes, the mountain walls close in and shut out the light. landscapes came to have a very different meaning. for the way nature was made part of life in town. And the form that oasis of peace took was a garden. A welcome, shady retreat from the heat and dust of the day. To the faithful, this was more than a collection of plants and pools. It was an earthly reflection of the heavenly realm. which gave us the word paradise. would flow with water, wine, milk and honey. and palaces which gracefully stand amidst the gardens. in a form that sprang, like Islam itself, from the desert. talking, eating, praying - was done close to the ground. especially when woven with an image of paradise. in the royal court of the Persian Shah. And this is an extremely rare, fragile survival. There are butterflies and birds. A leopard pounces on a goat. which meet in a central pool. The garden carpet was more than an oasis of super-abundance. paradise gardens came with a health warning. fateful moment back in Eden. culminating in the crucifixion of Christ. ride out to enjoy the fruits of wise government. sewing and harvesting in peace and fruitfulness. Two seasons in one painting. of pagan classical writings about the landscape. extolled the pleasures of country life and labour. "Their ease among the cornucopia." Virgil is looking hard in only the way that only a real countryman can. He's sort of poking the pigs and checking the flocks and herds. working his nose to sniff the wind. and the perfumes of rustic life here. to the croak of frogs down in the mud. that vision of a balanced life in the countryside proved irresistible. and even some animals were kept. But that didn't always preclude a sense of humour. learned in pretty much everything. would rhyme with the lay of the land. His brief was to cover the villa walls with frescoes. What makes this villa special is its sense of playfulness. and, so, in his way, of course, is Andrea Palladio. and Daniele's translated the great classical work on architecture. is to have that translated in painting by Veronese into allegory. The planets and the gods, cavorting on the ceiling. And, yes, that's what we have. We have a mysterious white woman in the middle. We have the gods of abundance and family life. And, then, suddenly, you catch sight of a parrot. in a gorgeous, haute couture number. a woman of the ordinary people. And you think, "Hang on a minute, they don't belong with the gods." Something extraordinary is going on here. everything we see in the villa. a spectacularly teasing kind of fun house. you don't usually go for it for jokes, really. and that was Veronese's cast of mind. with what he could do best, with what Venice did best. even if you're doing it in fresco rather than oils. people coming at you, behind you - hello! and you realise the whole place is alive with mischief. the mind-set is real enough. Happy, horsey comings and goings. the unhurried pleasures of a country house weekend. there were harvest failures and peasant riots. But, here at Villa Barbaro, it was always spring or summer. The grapes would always be ripening, the lutes would always be playing. and shoot a pheasant or two, his dog trotting at his heels. and feel warm inside forever. it turned its back on the bucolic dreamworld. from the glowing, sunlit stone of the villas of the Veneto. really came into its own. religious scenes, albeit ones strangled in greenery. until Altdorfer made nature itself, by itself, the whole story. that's pretty much what it is. Because with this little painting, the landscape suddenly happens. and becomes the work of art itself. Well, what Altdorfer has done is something extraordinary. which gives this watercolour painting its title, Woodcutter. he's on lunch break. He's got a jug of something. It's the German world, it's got to be beer, I would think. And he's laid his axe down. when you see landscape as background. There, the characters are full and frontal. There is, of course, a heroic character in this painting. dwarfing the little figure sitting at its base. And doesn't that tree remind you of someone else? on his wooden cross, arms outstretched? and I think there's a reason for the disguise. Altdorfer is actually in a sticky position. that was the Protestant Reformation. was about the so-called idolatry of images. of brutal and bitter partisan religious conflict. but it is also very raw and rough and coarse. with a pointed, sharpened twig. when it describes these leaves. This is a portable thing. It's not stuck in a church, like an altar piece. It's not stuck on a wall, like a fresco. You can own this, you can carry it around. A new kind of art is born here, and Altdorfer knows that very well. by disguising it in nature. But they did something else as well. They tapped into a Teutonic sense of identity. The notion of a natural German homeland in the forest. the audience for landscape art dramatically increased. were landscapes loaded with symbolism. The sacred tree, the Gothic wood. Mostly, though, they were devoid of human beings. a different artist would crowd his landscapes with people. cycle, the labours of the months. These, of course, are on an epic scale. But, here, there's not a single feudal lord to be found. real villages with people working and playing together. Bruegel himself was no brush-wielding yokel. He was learned and well-travelled. He'd taken a trip over the Alps to Italy, sketching as he went. alongside depictions of his low-lying, Flemish home. from huge vistas to the smallest detail. unsentimental, rugged, which demands a closer look. but was there ever an image less brimming with Yuletide cheer? Those hunters haven't got much to show for their trouble. A skinny fox suspended from their poles. feel the pain as much as their masters. that anybody could remember in their lifetime. the Spanish Empire and the free Dutch Republic. none of that history seems to matter. is a consolation for the traumas afflicting civilisation. the cattle will still return to their winter pasture. about the way he wants us to look at these paintings. between the universal and the particular. we are invited into a wealth of detail of work and play. the glide of the skaters across the ice. we're carried to dramatically different places. out to the broad, open sea. like the experience of all of our lives. On the one hand, we're immersed in the here and now. hour to hour, task to task. It's our daily routine. But, then, something else happens. like that one bird, perching on that naked, leafless branch. And everything, somehow, is pulled together. the entirety of human society. And we're very, very lucky. and our particular, special, little place inside it. one of the most unforgettable characters in all of European art. the prospect of which makes that burden just about bearable. It's a lesson in the perseverance of the poor. For what alternative does she really have? but into the human condition. of a war for religious and local liberty in the Netherlands. He couldn't know it would last for 80 years. But he evidently feared the worst. a frantic, mass migration of refugees. in the midst of human disaster. at buying pictures which reminded them of what they were defending. precisely the kind of low art which Italians condescended to. The life of the rustics. It was what the Dutch were most passionately attached to. The simple face of their homeland. for physically making so much of it. but the Dutch made Holland. This was an area called the Beemster. while the Dutch were at war. it had this deep, psychological effect on them. and the pictures they would produce would belong to the whole people. to service this popular demand for landscape art. Jan van Goyen was one of those workhorses. which makes Van Goyen's paintings remarkable. You forget what an amazing breakthrough this represents. and how he's painting it. It's like a sketch. actually makes you feel there. and you don't see anything else of the house. Why? Because they're actually below the water line. and you think you're waking up and you can smell the peat turned over. It's a kind of raw day in the middle of winter. But this still, in its scraped-away authenticity, is a kind of home. who could make masterpieces out of the same, modest subject matter. with huge, rolling clouds as its cast of characters. to make them more theatrical. The romance of ancient ruins, the sinister darkness of a boggy wood. the great emblem of Holland has become a hero in its own right. almost spiritually meaningful to everybody who's going to look at it. and this is high theatre. but he's made it absolutely enormous. It has a kind of authority to it. There is dirty weather ahead. These clouds are boiling up into what might be a storm. There are deep shadows hanging over the landscape. And then I think of the date. that the Dutch had about going it alone in Europe. England and France, as indeed they were. between those two hostile states. is a guardian against peril. not accidentally, form the cross of the Redeemer. There's a saviour, and the saviour is the windmill. "so man needs the breath of God to act." The moral is never forget the word of God. You have a covenant with God. You are his modern, chosen people. Just remember that when you look at the mill. are the nurseries of great landscape painting. in the bitterly divided American republic. and see an unclouded Eden. paradise illusions, all shining with the stage lighting of Providence. were sentimentally forgettable once the war was over. came out of the craving for landscape consolation. both tragic and hopeful at the same time. of all 19th-century American artists. Winslow Homer was then just 29 and fresh from the battlefield. he'd seen the carnage first-hand. Homer's picture comes down to earth and plants us deep in the soil. but also, of course, deeply blood-soaked. was still raw in Homer's mind. thanklessly toiling, and, I believe, also something of Homer himself. of course, the endless regiments of the fallen, embodied in the wheat. But, most of all, it's a picture of American gold. standing beneath an infinitely blue harvest sky. American future, planted in boundless American space. Lincoln himself never lost that faith. to the people for all posterity. this would be at least one place of miraculous healing. Yosemite in the Sierra Nevada. Yosemite became America's most sensational tourist destination. Its lonely beauty instantly compromised by its popularity. as they did much of America - as empty of native people. The Miwok Indians were either moved on or painted out. he too cleared the view of humans. a teenager from San Francisco visited Yosemite for the first time. were supposed to get, and Adams was one of those. Visiting Yosemite was an epiphany for Adams, like falling in love. Ansel Adams' miracle moment came in 1927.
to the precipitous spot known as the Diving Board. almost black, and create an extreme contrast between snow and mountain. of American, or any other, art. Adams called it his visualisation. Not what his eye but the inner lens of his imagination, could see. the high priest of its temple, of its stone, its light and its water. was an America irradiated with luminous majesty. more powerful than the mightiest business corporation. And he wanted Yosemite to be for everyone. by the lust for a fast buck. a hymn to the beauty of the natural world, and an instant bestseller. through its encounter with nature. to go and try and persuade presidents to his point of view. with the fate of the Earth. In 1977, the photographer as prophet had his moment. on a mission to outer space. On board was the Golden Record. Adams' paradise images were among them. then his photographs weren't a beautiful lie either. and the invention of the human heart. "and are sometimes granted vistas." it turned around its camera for one final time. on our place in the cosmos. the history of different civilisations through artefacts. and follow the links for the Open University. Simon begins in the 10th century, in Song dynasty China. The Song's scrolls are never innocent of the values of that world - the landscapes depict immense mountains projecting imperial authority. But as that authority was threatened and overwhelmed, majestic mountains are represented in geological turmoil, writhing and heaving. Imagined paradises in Islamic and Western art are often responses to loss and absence. But paradise could be recovered in the country villas of the Renaissance. Simon goes to the miraculously beautiful Palladian house of Daniele Barbaro in the Veneto, with murals painted by Paolo Veronese to contemplate the world of the cultivated country gentleman. It was in the cooler climate of northern Europe that landscape came into its own as a distinctive type of art. Simon explores the works of the northern Renaissance in Germany and the Netherlands, where emerging states sought expression of identity through depiction of their natural worlds. Simon ends in America where the landscapes of America are as expansive as the landscapes of Holland were confined, but there too, in the numinous photography of Ansel Adams, a kind of earthly paradise is revealed and a sense of nationhood is expressed in the natural world.